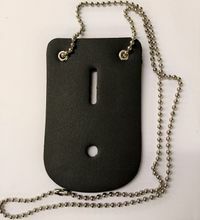 Wear your badge around the neck with sturdy bead chain and leather badge holder. Easy to conceal and to access for easy display when needed. Excellent quality heavy duty leather badge holder with neckchain.